There’s a lot to see at the Harvard Museum of Natural History but I spent most of my time with the beetles. 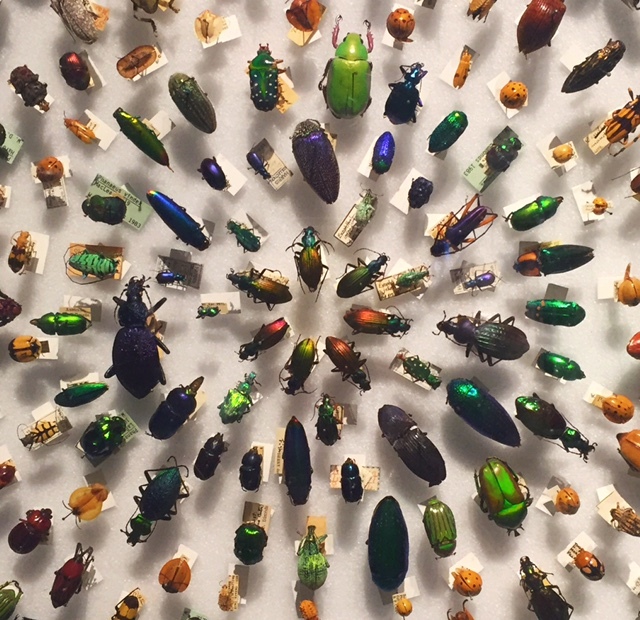 It turns out that one out of every four animals on earth is a beetle. About 350,000 species have been identified. Harvard’s collection contains only a fraction of this vast diversity but it’s slightly dizzying even so. The beetles are arranged in rows and circles, atop the tiny white rafts of their nametags. They come in every shade and shine of color and a bewildering variety of forms. I see horns and spikes and vast jaws, bodies like leaves and others built like tanks. They are chunky, skinny, squat, leggy, blunt, delicate, jeweled, drab, huge and infinitesimally small. An individual beetle might not seem like much, but as a group they’re a masterwork. Each species as firmly fixed to its place in the universe as these pinned specimens here. 350,000 different solutions to the single problem of survival. I never realized before how beautiful they are. I think that’s what kept me there, while the kids ran off to find the stuffed elephants and the dinosaur bones. Just the surprise of it. Nice. In awe of the beetles.